WELCOME TO ENTERPRISE CONNECT 2019! We're excited to have your participation as an exhibitor or sponsor. We want to make sure your company has the best possible experience. To accomplish this we have developed the Exhibitor Co-Marketing Program to help you promote your presence and drive traffic to your booth. All co-marketing tools and resources are FREE for you to use! WHY PARTICIPATE IN EXHIBITOR CO-MARKETING? Earn rewards just for promoting your presence at Enterprise Connect 2019! Your Unique Discount Code will apply an exclusive $500 discount on Entire Event and Tue–Thu Conference passes. Be sure to share your discount code in all your promotional efforts. Your unique discount code and unique URL will be emailed to your company's primary contact and can be viewed in the Exhibitor Portal. If you have questions or have not received this information, please contact Maria Nelson (415-947-6061, [email protected]). Your unique discount code should be used on all promotional items, so your customers or prospects can easily take advantage of the $500 off discount. Your Unique URL has a unique tracking code designate to your company and automatically applies the $500 discount. The Unique URL requires cookies to be enabled to transfer the discount. When to Use Unique URL: Banner Ads, Email Signatures, or promotions with copy restrictions. Every unique Conference Pass (Entire Event or Tue–Thu) registration that comes in with your discount code will earn you to $100 off your final Freeman Decorating bill. This program ends Friday, March 15, 2019 at 11:59 PM ET. No registrations received after this date will apply towards this program. Swap Freeman Rewards for Additional Entire Event Conference Passes! Exchange five (5) Freeman Rewards for one (1) Entire Event Conference Pass, valued at $2,695. Not only does Enterprise Connect provide FREE resources for exhibitors and sponsors to promote their presence, you earn rewards just for participating! "Most Social Exhibitor" sign for your booth and SAVE $100 off your final Freeman Decorating bill. Invite your customers and prospects to join you with your customized landing page which will include your logo, discount and custom messaging about your company. 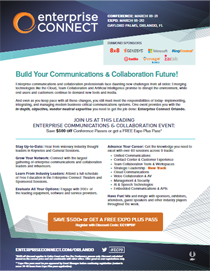 EVENT INVITATION – SHARE A $500 DISCOUNT ON CONFERENCE PASSES OR A FREE EXPO PLUS PASS! Provide a $500 discount on Entire Event and Tue–Thu Conference passes or offer a FREE Expo Plus* pass to clients and prospects. This is an excellent way to invite customers and prospects to visit your booth or listen to your company's representatives within a conference session at Enterprise Connect. Distribute passes on your website and through all your sales channels, such as your customer base, prospects, sales offices and user groups to increase booth traffic. The Expo Plus Pass includes admission to the Exhibition and Free Education Programs. If you'd like a customized PDF Invitation, please contact Maria Nelson. Engage with the Enterprise Connect audience through our social media channels. Stay connected year-round by joining us on Twitter, LinkedIn, Facebook, YouTube and Google+. Be named "Most Social Exhibitor," complete with a title sign for your booth, exposure on social media, and SAVE $100 off your Freeman Decorating Bill. The exhibiting company with the most tweets* containing "#EC19" or "@enterprisecon" by March 15, 2019 will win. Share your discount code and provide updates about your company's activities, product and other news through twitter, and we'll retweet it on Enterprise Connect Twitter account. Include #EC19 in your tweets for tracking purposes. Create a Facebook fan page about your presence at Enterprise Connect, and we'll highlight it on Enterprise Connect Facebook page. Facebook is great way to share your discount code, post details on new products you’ll be displaying in your booth, invite customers to your meetings and parties, and upload relevant photos. Promote your presence, share your discount code, and invite your community to come see you at Enterprise Connect 2019. Create videos about your company's activities at Enterprise Connect and we'll help it go viral. Send us the URL and we'll add it to our favorites and promote it via our social media channels. Include the Enterprise Connect logo in your web and email communications. Make sure it links to www.enterpriseconnect.com/orlando OR your unique URL so your unique discount code can be applied. Download Enterprise Connect banner ads for your website or to include in your email signatures. Make sure to link banners to www.enterpriseconnect.com/orlando OR your unique URL so your unique discount code can be applied. For banners offering $500 off discount, please either include a text encouraging your customers to manually enter your unique discount code during the registration process or contact Maria Nelson for a personalized URL that will automatically apply the discount on Entire Event and Tuesday-Thursday Conference passes. For additional banner sizes or file formats, please contact our Co-Marketing team. If you have any questions, need additional materials or would like to learn more about how to promote your presence, just let us know. Contact Maria Nelson at 415.947.6061 or [email protected] with any co-marketing related questions.